Like the redesigned S4 sedan, the S5 convertible gets a supercharged 3.0-liter V-6. Fire it up, and the 333-horsepower engine settles into a low, flat burble. I'll admit it — at times, I found the noise taxing, but I'm not one to crank the bass on my stereo. (In my well-worn Toyota, such shenanigans might blow out a speaker … or an A-pillar.) Past idle, the exhaust turns into a higher whine I'll take any day over the 211-hp A5's gravelly roar. The engine pulls strong as revs build higher, but its character comes closer to the G37's normally aspirated V-6 than it does to BMW's turbocharged six-cylinder. There's no wall of grunt early on. Push harder, and the engine turns out thrust comparable to the 335i's — and then some, evidently. BMW says an automatic 335i convertible takes 5.7 seconds to hit 60 mph. 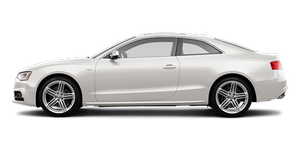 Audi says the S5 does it in 5.1 seconds. Activate the automatic's Dynamic mode, and it fetches lower gears to power through corners or accelerate up on-ramps with near-instinctive response. Even in the transmission's in-between Auto or cushier Comfort settings, kickdown happens without too much delay. In any of the three modes, the transmission comports itself far smoother at low speeds than most dual-clutch automatics. The standard four-wheel-disc antilock brakes are larger here than in the A5. The pedal delivers firm stopping power, and it's easy to fine-tune your deceleration. Hammering the brakes on hilly roads all afternoon, I didn't find any objectionable levels of brake fade. At least for the foreseeable future, the S5 coupe will retain its 4.2-liter V-8. That marks a reversal of earlier plans to switch to the supercharged V-6. Count me pleased; dismal gas mileage notwithstanding, other Cars.com editors are a big fan of the 4.2. The S5 convertible, at least, gets a respectable EPA-rated 17/26 mpg city/highway.